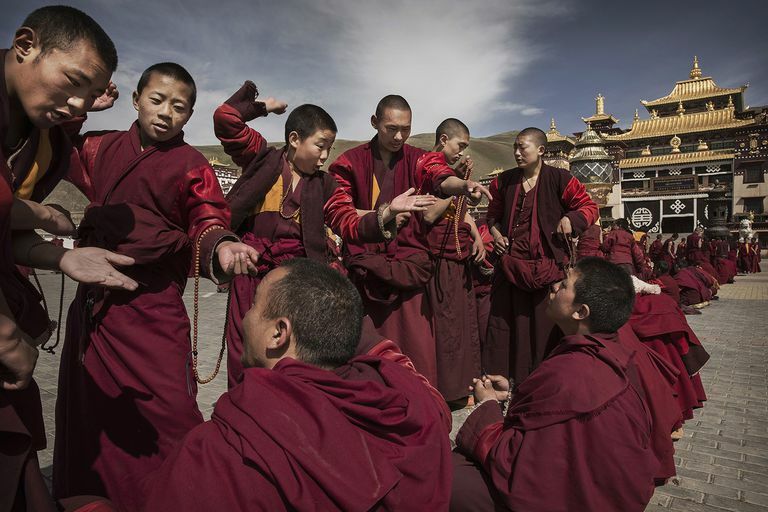 SERSHUL, CHINA - MAY 20: Tibetan buddhist monks, who are prohibited from harvesting cordycep fungus, debate on May 20, 2016 outside the Sershul Monastery on the Tibetan Plateau in the Garze Tibetan Autonomous Prefecture of Sichuan province. The Buddhist Precepts are not rules everyone must be compelled to follow, such as the Abrahamic Ten Commandments. Instead, they are personal commitments people make when they choose to follow the Buddhist path. The Practice of the Precepts is a kind of training to enable enlightenment. The Fourth Buddhist Precept is written in the Pali Canon as Musavada veramani sikkhapadam samadiyami, which usually is translated "I undertake the precept to refrain from incorrect speech." The Fourth Precept has also been rendered "abstain from falsehood" or "practice truthfulness." Zen teacher Norman Fischer says the Fourth Precept is "I vow not to lie but to be truthful." In Buddhism, being truthful goes beyond simply not telling lies. It means speaking truthfully and honestly, yes. But it also means using speech to benefit others, and not to use it to benefit only ourselves. Speech rooted in the Three Poisons -- hate, greed, and ignorance -- is false speech. If your speech is designed to get something you want, or to hurt someone you don't like, or to make you seem more important to others, it is false speech even if what you say is factual. For example, repeating ugly gossip about someone you don't like is false speech, even if the gossip is true. Soto Zen teacher Reb Anderson points out in his book Being Upright: Zen Meditation and the Bodhisattva Precepts (Rodmell Press, 2001) that "All speech based on self-concern is false or harmful speech." He's saying that speech based on self-concern is speech designed to promote ourselves or protect ourselves or to get what we want. Truthful speech, on the other hand, arises naturally when we speak from selflessness and concern for others. Untruthful speech includes "half-truths" or "partial truths." A half or partial truth is a statement that is factually true but which leaves out information in a way that conveys a lie. If you ever read the political "fact check" columns in many major newspapers, you find a lot of statements called out as "half-truths." For example, if a politician says "My opponent's policies will raise taxes," but he leaves out the part about "on capital gains over a million dollars," that's a half-truth. In this case, what the politician said is intended to make his audience think they if they vote for the opponent, their taxes will go up. Telling the truth requires mindfulness of what is true. It also requires that we examine our motivations when we speak, to be sure there isn't some trace of self-clinging behind our words. For example, people active in social or political causes sometimes become addicted to self-righteousness. Their speech in favor of their cause becomes tainted by their need to feel morally superior to others. The expression of falsehood, either with words, gestures, or "body language." If one says an untrue thing while sincerely believing it is true, that would not necessarily be a violation of the Precept. However, take care of what libel lawyers call "reckless disregard for the truth." Recklessly spreading false information without making at least some effort to "check it out" first is not practicing the Fourth Precept, even if you believe the information is true. It's good to develop a habit of mind to be skeptical of the information you want to believe. When we hear something that confirms our biases, there's a human tendency to accept it blindly, even eagerly, without checking to be sure it's true. Be careful. The practice of the Fourth Precept does not mean that one must never disagree or criticize. In Being Upright, Reb Anderson suggests that we distinguish between what is harmful and what is hurtful. "Sometimes people tell you the truth, and it hurts a lot, but it is very helpful," he said. Sometimes we need to speak up to stop harm or suffering, and we don't always. Recently a well-respected educator was found to have been sexually assaulting children over a period of several years, and some of his associates had known about this. For years no one spoke up, or at least, did not speak up loudly enough to stop the assaults. The associates possibly kept silent to protect the institution they worked for or their careers, or maybe they couldn't face the truth of what was going on themselves. The late Chogyam Trungpa called this "idiot compassion." An example of idiot compassion is hiding behind a facade of "nice" to protect ourselves from conflict and other unpleasantness. "Speaking falsely is also killing, and specifically, killing the Dharma. The lie is set up to defend the idea of a fixed entity, a self image, a concept, or an institution. I want to be known as warm and compassionate, so I deny that I was cruel, even though somebody got hurt. Sometimes I must lie to protect someone or large numbers of people, animals, plants and things from getting hurt, or I believe I must." In other words, speaking truth comes from a practice of truthfulness, of deep honesty. And it is based on compassion rooted in wisdom. Wisdom in Buddhism takes us to the teaching of anatta, not-self. The Practice of the Fourth Precept teaches us to be aware of our grasping and clinging. It helps us escape the fetters of selfishness. The foundation of Buddhist teaching is called the Four Noble Truths. Very simply, the Buddha taught us that life is frustrating and unsatisfactory (dukkha) because of our greed, anger, and delusion. The means to be liberated from dukkha is the Eightfold Path. The Precepts relate directly to the Right Action part of the Eightfold Path. The Fourth Precept is also directly connected to the Right Speech part of the Eightfold Path. Working with the Fourth Precept is a deep practice that reaches into your whole body and mind and all aspects of your life. You will find that you can't be honest with others until you are honest with yourself, and that can be the biggest challenge of all. But it's a necessary step to enlightenment.